First off, let me say that this pen brand is well known in the art community and is widely accepted as a good beginner pen, but at the same time, it is a pen that stays with you throughout your career. You can get this 8 pen set on Amazon for roughly $12, which makes them approximately $1.50 each. There are a few things that I look for in apen brand is whether or not it is made with Archival ink. The reason that I look for this is because, over time, ink will wear down and fade or even turn a brownish color. However, archival ink will stand the test of time being both waterproof and fade proof. I would like to also note that each individual pen in this set has their own pros and cons. Something to keep in mind is that I am using just regular printer paper which is fairly thin just to measure the bleed through. 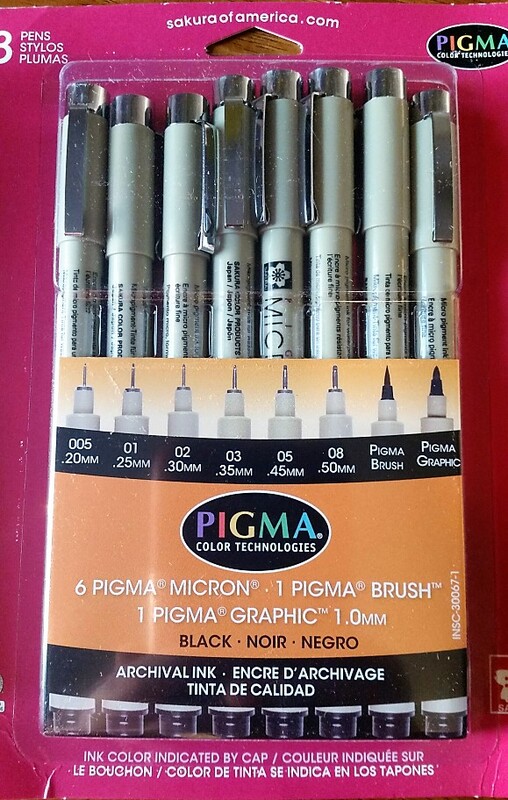 Pigma Brush Pen – This pen is really weird and hard to control your line, especially if you are not used to brush pens. However, it seemed to have a sturdy tip and wrote beautifully without skipping. Pigma Graphic 1 – This pen is one that I typically use for my main lines. The tip is very sturdy at all angles and writes without skipping. With my other set of these pens, I realized that this Graphic pen seemed to dry up quicker than the others. 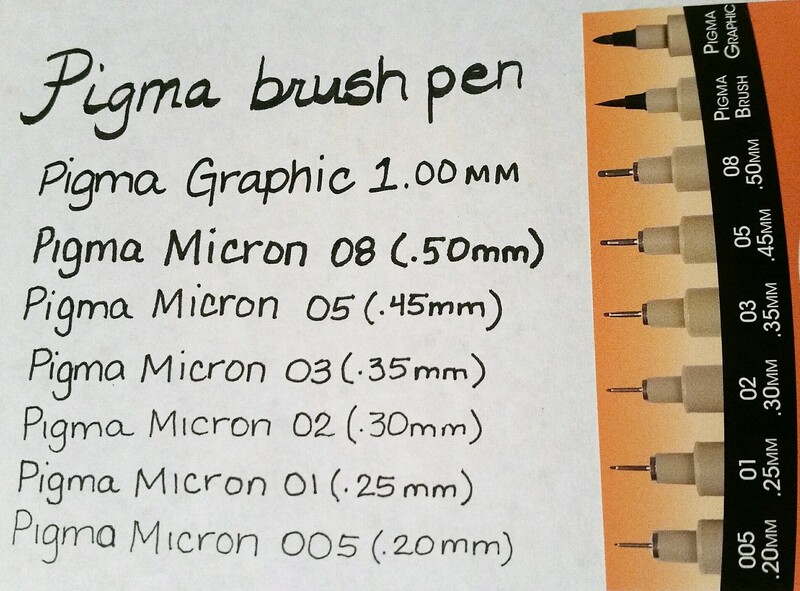 Pigma Micron 005-08 – These pens have varying thickness of lines. If you look above, You can see how each one gets smaller than the one before. One thing to note is that the smaller the tip, the more gently you need to write with them. I was a little afraid to press with any “normal” pressure on the three finest tips, but I can see where they come in very handy with detail in my art. I ran my finger across the ink of each pen immediately after I drew a line and noticed that there was no smearing, even with the brush tip. As far as bleeding through to the back of the paper. I did notice that the places where I started and stopped seemed to bleed through more than the lines. However, over all, the bleed through was minimal if at all. The picture below shows the bleed through. 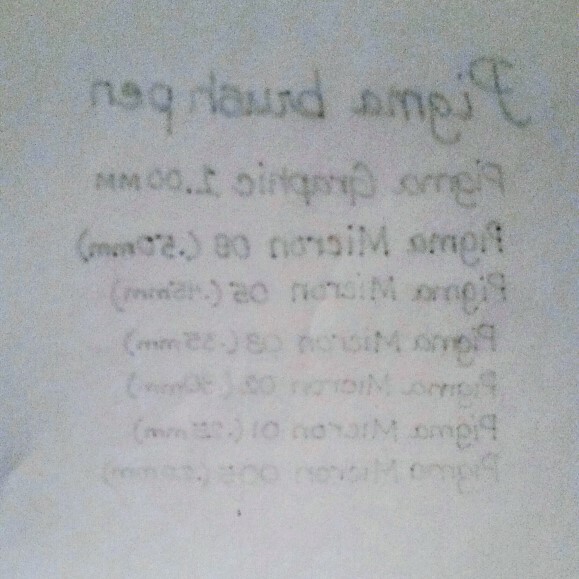 Keep in mind that this is everyday printer paper. The simple fact that these pens have such a wide variety of tips is amazing to me. You can truly complete any task with these. They write smooth and the pen is easy to handle and comfortable in my hand. I would definitely recommend this pen to any artist for multiple projects.